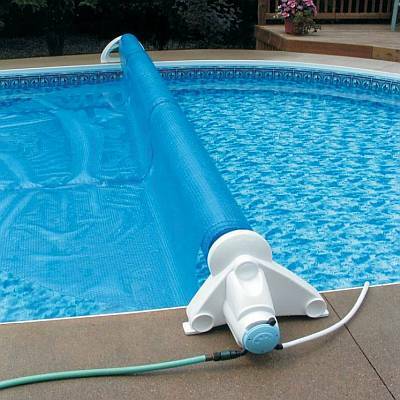 Solar Covers or Blankets uses the Suns energy to keep your pool warmer. A Solar Pool Cover is the least expensive way to keep your pool water warm extend the length of your swimming season. . They are also called blankets. They resemble giant sheets of bubble wrap. The bubbles trap heat from the sun and keeps the heat in the pool, keeping the water temperature warm and inviting. Solar covers float freely on top of a pool without tie-downs or anchors to hold them in place. Removing a solar cover is easy, just pull it off and store it. This job can be a bit sloppy - imagine folding a giant wet blanket by yourself . Recruiting a helper to roll or fold it up or the aid of a solar cover reel makes the task much easier. Solar covers are usually folded and stored or rolled-up on a large reel and wheeled out of the way. Heat in the water is lost primarily (up to 60%) by evaporation. 30% is lost due to radiation to cooler air. Their main purpose is to trap the heat of the water under the cover and prevent heat from escaping into the cool night air and prevent water evaporation.. They work equally as well on both Above Ground and In Ground Swimming Pools. Extend the swimming season and save money on chemicals and water replacement due to evaporation. 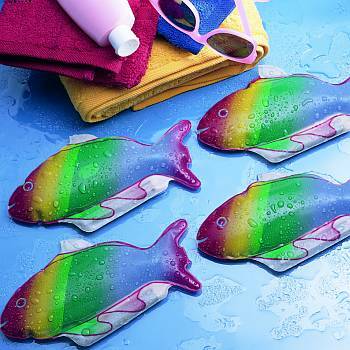 They are ideal for use in sunny climates because the more heat they can gather, the longer they can extend the swim season. 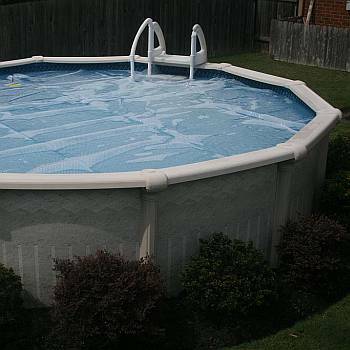 Solar pool covers can keep the water temperature, 10-15 degrees when used. It is important to remember that, although any cover will reduce some of the debris that enters a pool, solar pool covers are not designed specifically for cleanliness, nor are they considered safety covers. These covers should be completely removed from the pool before swimmers enter the water. Solar Covers make heating your pool more efficient. Bubble side goes down! There is more of the cover that will touch the water and the surface tension helps hold the cover on the water. Also the sunlight seems to get focused by these bubbles like lots of little magnifying glasses. The flat side goes up. 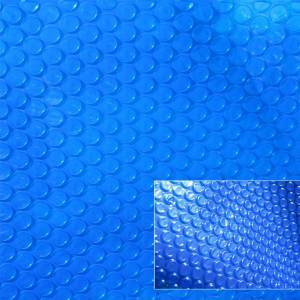 This allows for fallen debris and dirt to be easily removed when needed and to not catch in between the bubbles. Running the pump and filter system while the cover is on the water is absolutely safe. DO NOT leave the cover on grass or other plants. It will burn them up. DO NOT use the cover after shocking the pool. High concentrations of chlorine can damage it. When in extended periods of time on no use (Winter or Hot part of summer) Let cover dry, roll/fold up cover and store in cool dry place. Cover it when on a reel. 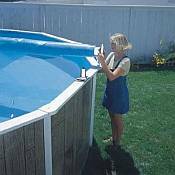 Cut the cover into smaller rectangle if you have a LARGE pool without a reel. It makes the cover easier to take on/off and easier to store. Reduces Evaporation - A solar blanket cover can cut water evaporation (water loss) up to 95 percent. Retain Heat - When the sun sets and the night air cools, heat in your pool water is lost. A solar blanket floating on the water keeps much of that heat from dissipating. If you heat the water with a gas or electric pool heater, then this will save you a boat load of money too. Keep Bugs and Debris Out - Although it's not their primary purpose, solar covers do shield your pool from bugs and debris such as leaves and twigs. Use a hand skimmer to scoop it off before removing the cover.